The future ABC House under construction on Aug. 9, with the Linn County Courthouse across Fifth Avenue. CARA is being asked to give $10,000 to another downtown Albany building venture, but the push for major projects to complete and then wind up the 17-year-old urban renewal program seems to remain stalled. The agenda for the Aug. 15 meeting of the advisory committee of the Central Albany Revitalization Area lists only one specific item. 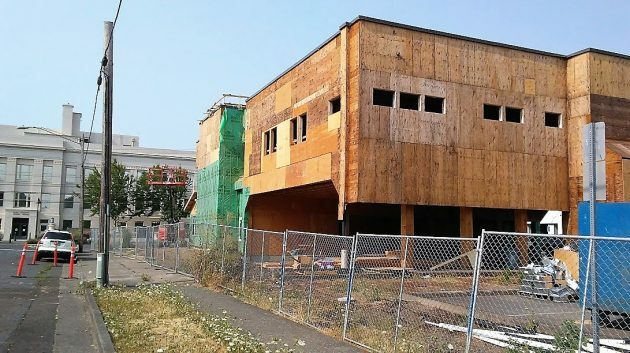 It’s a request by ABC House for a $10,000 grant to help pay for what it says is the roughly $100,000 expense of putting siding of the long-vacant former insurance building at 228 Fifth Ave. S.W. The private nonprofit, which works on reported cases of child abuse, is remodeling the building it bought in 2015 for $775,000. On the tax rolls, the property is valued at $481,660, and the purchase exempted it from paying property taxes starting in 2016. Its taxes amounted to nearly $9,400 in 2015. 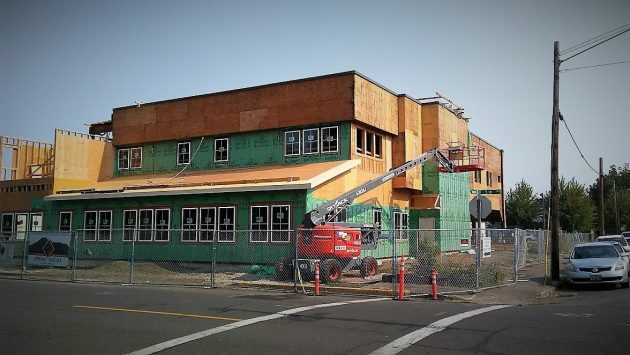 The CARA agenda material says the remodel is estimated to cost more than $3 million, and ABC House has been conducting a fundraising campaign to pay for it. In a memo to the CARA board, Economic Development Manager Seth Sherry recommends approval of the grant in the interest of eliminating blight. The organization says in its application that if if doesn’t get the grant, it will have to raise the amount elsewhere. It was a year ago, with the $8 million downtown streetscape project set to wind up in 2018, that the CARA board was urged, by the mayor among others, to start thinking of its next major effort. So far, though, it has not publicly discussed, let alone pursued, anything big. The CARA district, started in 2001, had a list of about 50 projects estimated to cost $56 million by the time they were done. The district was to borrow money to accomplish them, repay the borrowed money with taxes siphoned from other taxing districts including the city, schools and county, then go out of business by about 2026, allowing the other taxing district to recoup their losses with the tax revenue from the then-higher value of the urban renewal district. This side of the future ABC House faces Fifth Avenue. So, borrow money for their pet projects. Siphon off money from other tax sources, have a plan to go out of business in 2026 and “allow” those tax districts to recoup their money later. Sounds like your basic Ponzi scheme to me. But then politicians have never been afraid to waste OPM (other people’s money). +1 to what Ted said. What! Are we rubes? “The organization says in its application that if if doesn’t get the grant, it will have to raise the amount elsewhere.” ……..O.K. Get it elsewhere. Re “Ted’s” comments, you are right. But, after 25 years of having money siphoned from necessities such as schools, those entities can never recoup that money. Urban renewal was a big fad started years and years ago in California. California has since outlawed the tax increment financing Ponzi scheme that works against poor people, and that means they no longer have new urban renewal districts. They are trying to pay off the loans on the ones they had. Think aluminum siding. Long lasting. Light. Pretty to look at. And, thanks to recent tariffs on foreign metals, we can reasonably assume it will be American made. In fact, aluminum futures are looking strong. Perhaps CARA could invest in commodities as a hedge against future setbacks. Hasso, what grade would you say CARA has earned in its 17-year existence? And what would you list as its top three achievements? If challenged like this to give a grade, I would say “C.” It’s hard to say how much of the downtown building renovations would have happened anyway, eventually, but CARA contributed to their being done. The program has done little to improve the area east of Lyon. It’s biggest partnership, Edgewater Village, has been plagued by delays. It has ignored, more or less, its 2001 list of projects. Its financing method, tax increment financing, is subject to legitimate criticism because CARA reaps the benefit even of value increases which it did nothing to cause. No? I feel like the naysayers think that without the “tax scheme” life would be better. Scratch that. You all think it would mean more $$ in your pockets. Ha! Dream on. Thanks Hasso. Appreciate the thoughts and analysis.